The people on CNBC, and their guests, have once again completely lost their mind. The show has become a 24 hour a day live streaming celebration of new DOW highs, which at times feels more like a Saturday Night Live skit. Unfortunately, someone accidentally booked Peter Schiff to come speak with Maria for a few minutes on Friday afternoon, and the studio was hit with something they have not heard in a while and had no answer for: reality. Maria, who appears to be literally drunk off the DOW highs, continues brushing off every real economic data point Schiff provides and counters with "there is no other option for stocks" and "the Fed has this market going higher." The other guest is even more laughable as he provides a real time look at what the network's market analysis has become. For a helpful visual on the economic data Schiff is discussing you can see its strength below in the US Macro economic data (red line). 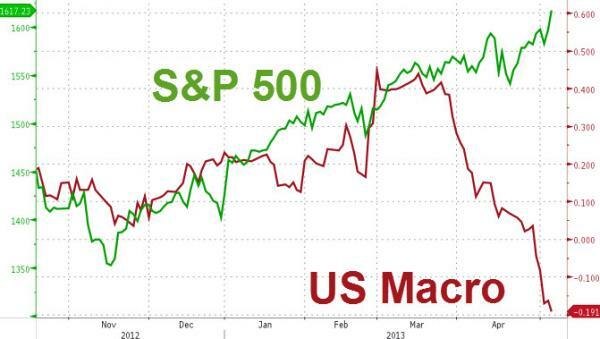 The green line is the S&P 500. We now live in a world where what takes place in the actual economy has no relevance. Good economic data makes stocks go higher, and bad economic data makes stocks go much higher. Why? Terrible economic news just means more Fed printing, which can then be re-invested by the banks back into the stock market in a perfectly healthy loop that is now the American economy. Pass the bubbly, and watch that ticker roar to 16,000 and beyond because when this madness ends as Schiff points out; it will make 2008 look like a Sunday picnic.